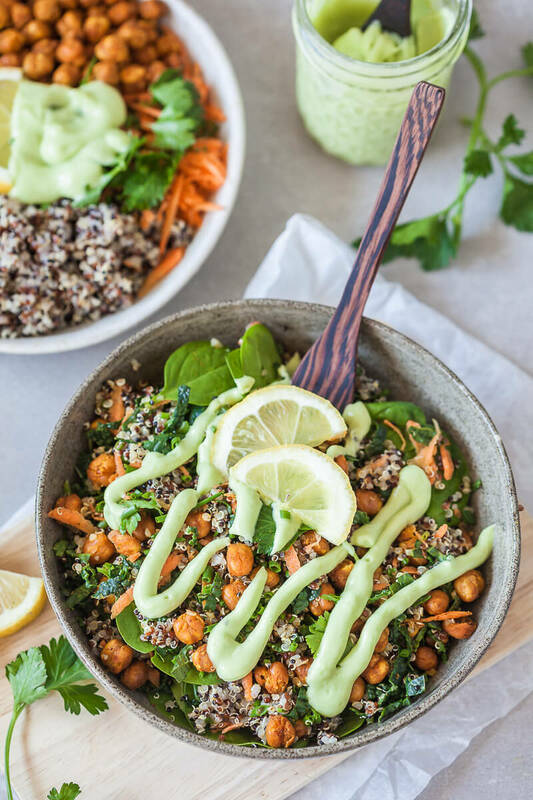 This Vegan Quinoa Buddha Bowl uses kale and roasted chickpeas and is completed by a delicious Avocado Cream Dressing! Simple, Vegan and Gluten-Free. Cook quinoa according to package instructions: add 1 cup quinoa to a pot with 2 cups of water, season with salt and bring to a boil. Then lower the heat to a simmer and cook for about 15 minutes, until the quinoa has soaked up all of the water. Remove from stove and set aside to cool. Run a fork through the cooked quinoa to loosen it. Prepare roasted chickpeas: open can, drain chickpeas and pat dry with a paper towel. Add a table spoon of oil and season with spices: red paprika, turmeric and cayenne pepper (1/2 ts each), pinch of salt, thyme and oregano. Mix well to combine, place on a baking tray lined with baking paper, and place in the oven preheated to 200°C / 390°F. Bake for about 25-30 minutes until the chickpeas turn golden brown. Remove from pan and set aside to cool. Prepare the avocado cream dressing: blend ingredients until smooth. Depending how thick you like your dressing add more or less water. Store in an air-tight container. Prepare the vegetables: wash and dry baby spinach and kale, then cut into strips. Peel and grate carrot. Chop parsley. Assemble your quinoa salad: in a bowl, place cooked quinoa, spinach, kale, carrots, roasted chickpeas, and chopped parsley. Top with a squeeze of lemon and avocado cream dressing. Serve immediately, or store in an air-tight take-away container.